Fans of music and movies: the Film Society of Lincoln Center just announced the second edition of Sound + Vision. This music documentary series explores a diverse range of music, artists, genres, and styles from all over the world. It includes an eclectic mix of exciting premieres, retrospectives, musical performances, and more for music fans of all backgrounds. This year, the opening night selection is Eric Green&apos;s Beautiful Noise, which documents the rise of the influential bands Cocteau Twins, The Jesus and Mary Chain, and My Bloody Valentine through never-before-seen footage, over 50 interviews with artists, and highlighting new bands that have been influenced by them. Last year&apos;s Sound + Vision introduced moviegoers to a variety of musicians, from soul singer Charles Bradley as he prepared to release his first album at the age of 62, to rappers Los Aldeanos, who literally put their lives on the line to expose injustices of the Cuban government through their lyrics. The closing night film is Florian Habicht&apos;s Pulp, which follows the titular British band as they reunite and prepare for a final show in their hometown of Sheffield. Another highlight is the 30th anniversary screening of Jonathan Demme&apos;s highly praised classic Stop Making Sense, the Talking Heads concert film that was taped over three nights in 1983. Leonard Maltin said it was “one of the greatest rock movies ever made.” Plus, Talking Heads founding member and principal songwriter, David Byrne, will also be in attendance for a Q&A following the film. Also, three very special events will take place throughout the series. On August 5, New York-based band Glass Ghost will engage fans during their show by having them participate in a MyLyfe™survey, which will identify and analyze their emotions. That data will be used while the band plays and audiences can witness themselves and their data on screen. On August 6, indie-rock band Dragons of Zynth (D.O.Z.) will perform their ethereal rhythms and melodies. Finally, on August 9, documentary filmmaker and collector Joe Lauro will present performance footage of such icons as Bill Monroe, Elvis Presley, the Carter Family, Woody Guthrie, The Staples Singers, and more for Heroes of American Roots: From the Historic Films Archives. The first-ever documentary about one of the most influential, underground music movements of the 20th century. This is the story of Cocteau Twins, The Jesus and Mary Chain, and My Bloody Valentine and how their groundbreaking music, while not selling a whole lot of records, inspired generations of bands to come. From the late 1980s to the early 1990s, there was a period when innovative musicians mixed guitar noise into conventional pop-song structures while maintaining a philosophy of letting the music speak for itself. Ten years in the making, the film features over 50 interviews with members of the aforementioned bands, as well as Ride, Slowdive, Chapterhouse, Lush, Curve, Swervedriver, Medicine, Pale Saints, Seefeel, AR Kane, Telescopes, Catherine Wheel, Flying Saucer Attack, and special appearances by music icons Wayne Coyne, Trent Reznor, Billy Corgan, and Robert Smith. Twenty-five years after achieving success and fame (and selling over 10 million albums), the iconic band Pulp reunited for a 2012 “final” concert in their hometown of Sheffield. This doc, which traces the lead-up to the show, features archival footage, and modern-day interviews with the band members, the town locals, and Pulp’s multi-generational fans, creating a warm, affectionate portrait of an eccentric band and the people next door who love them. Front-man Jarvis Cocker is witty, humorous, and genuinely concerned that this concert be the show of a lifetime. An Oscilloscope Laboratories release. go baroque. Rehearsals and recording sessions bring them together to explore the 17th-century music of Scarlatti, Handel, and Bach. Marsalis worries throughout about his intonation while Battle is endlessly amused and supportive. The film widens its focus by following the two to their hometowns—Battle makes a special appearance with her old church choir in Ohio, and Marsalis travels to New Orleans to coach young jazz musicians and play with his renowned father and brothers. The film’s final performance with Battle, Marsalis, John Nelson, and the accompanying St. Luke&apos;s Chamber Orchestra is both quietly lyrical and joyfully triumphant. A New York–based Balkan brass band travels to a tiny Serbian village to take part in the 50th anniversary of the world&apos;s largest trumpet competition. The first Americans to attend, Zlatne Uste from New York City, face the reigning Serbian champs, the Dejan Petrovi&cacute; Band, and tough competition from a struggling Romani band, Demiran &Cacute;erimovi&cacute; Orchestra. The event is a celebration of music and culture, but beneath it lies the memories of war, bias against the Roma, and the ever-present need to succeed for simple economic reasons. But Zlatne Uste revel in the opportunity to meet other musicians and soak up Balkan identity and pride. Presented in association with globalFEST at Lincoln Center Out of Doors. Europe in 8 Bits explores the world of chipmusic, a trend that is growing exponentially throughout Europe. The stars of this new music movement reveal how to reuse old video-game hardware from the likes Nintendo and Atari by turning them into tools capable of creating original sounds, modern tempos, and innovative musical styles. It’s an all-new way of interpreting music performed by artists who show their skill in turning these “limited” machines designed for leisure in the 1980s into surprising musical instruments. Information and resources are shared online, while performances take place anywhere from basements to nightclubs in this latest techno-revolution. Director Tetsuaki Matsue (Live Tape, Tokyo Drifter) creates a trippy documentary portrait of Japanese didgeridoo player GOMA, who suffered partial memory loss following a car accident in 2009. Archival performance footage, home video, and photographs relate details of his life, from his marriage, the birth of his daughter, and his career leading up to the accident. The film’s psychedelic 3-D images, animation, and onscreen text, backed by GOMA’s trance-like music, create a sense of his fractured memory and emotional loss. Though he has trouble recalling his family and the recent past, GOMA was able to relearn his instrument and continue playing, while incorporating the incongruous memories that suddenly come back to him. Rodrigo Sánchez and Gabriela Quintero began their musical careers in Mexico City playing in metal bands. But when things didn’t seem to be going anywhere they decided to hit the road. Leaving behind their electric guitars, they end up busking on the streets of Dublin, performing acoustically. Drawing on influences from flamenco, salsa, and hard rock, Rodrigo y Gabriela’s exuberant new style secured them a fan base and ultimately stardom. Presented in association with Cinema Tropical. Over a period of seven years, Noël Dernesch and Moritz Springer followed two musicians on their search for a spiritual home far from the world they grew up in. While reggae has been popular in Europe for decades, the German “Gentleman” (Tilmann Otto) and Italian “Alborosie” (Alberto D‘Ascola) sought a deeper relationship to Jamaican music, people, and culture by moving to the Caribbean island to start anew. Culturally the music provides an outlet for the poverty, crime, and hardships experienced by many who live there, but it is also is the expression of a religious belief and way of life rejecting Western consumerism. Gentleman and Alborosie find a world away from the resorts, where, each in his own way, they find a place to belong. They are not merely culture tourists, they are true believers. Presented in association with globalFEST at Lincoln Center Out of Doors. The annual Festival in the Desert in Timbuktu draws musicians and audiences from all over the world. Manny Ansar, co-founder and festival director, talks about the challenges producing the festival each year and its goal of sharing music and camaraderie in a multi-ethnic society. However, with separatist rebels and hardline Islamic militants taking control of Northern Mali, music was forbidden and the festival was declared over. This film chronicles the 2011 (and potentially final) edition, featuring stunning performances by Tinariwen, Khaïra Arby, Vieux Farka Touré, Tartit, and more, as well as interviews with participants who talk about their uncertain future. Presented in association with globalFEST at Lincoln Center Out of Doors. Matthew Stoneman grew up in New Hampshire dreaming of fame as a pop star but instead ended up in jail. There, he learned Spanish and mariachi standards. Writing his own original songs, he has since become something of a star as the “Gringo Mariachi.” Over the course of four years, director Aaron Naar followed Matthew, now called Mateo, at his home in L.A. and on his frequent trips to Cuba. There is nothing predictable about Mateo, his reddish-blond hair and chinos, his attraction to Cuban women, and his complicated relationship with his family, yet he doesn’t seem to mind opening up about his life to the camera. And while Mateo is not a completely sympathetic character, he is a talented, driven musician who gets up everyday and goes after what he wants. Senegal is a country in transition, with increasing education and economic growth and a burgeoning art scene. It is customary that its culture, stories, and history have been kept alive and transmitted by their traditional singers called griots. Message by Music introduces us to Awadi, a renowned rapper with Pan-Africanist sensibilities and juxtaposes his political message with the more old-school griots. Transitions in society are reflected in the arts but also the arts can be the catalysts to move society. Small-town girl goes bad! 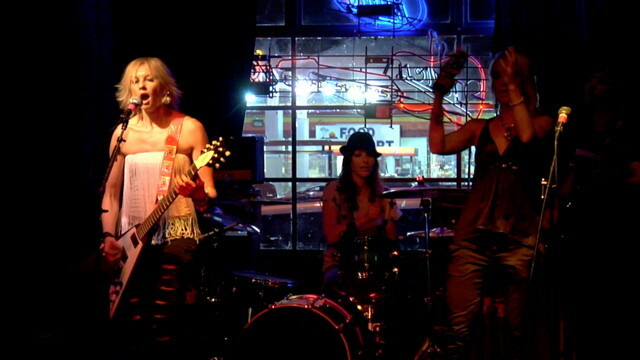 Rebekah Starr (her real name) has an all-girl band and wants to make a music video. She has a friend who has a friend in L.A. willing to shoot it, so&mldr; road trip! With Annika, her Estonian bandmate, she leaves her small Pennsylvania town to drive cross-country, picking up gigs and hawking CDs to pay bills. Along the way they make friends, some famous, like Steven Adler (Guns N’ Roses) and Rikki Rockett (Poison), who help out when they make it to Hollywood. Rebekah shows her tough, determined side, ready to leave it all behind for a shot at rock-’n’-roll fame. A creation of the kids living in Rio&apos;s favelas, passinho is a hybrid of pop, break dancing, and traditional samba, pagode, and frevo. Some of their backyard videos went viral and soon the small dance-offs started getting media attention, propelling some of the participants to local fame. Competitions are divided by age groups, with some dancers as young as five, but Emíilio Domingos’s documentary focuses on some of the most serious contenders all hoping to receive the king of passinho crown. Providing an alternative to drugs and crime, passinho brings a fresh optimism to the lives of Rio’s youth. Presented in association with Brasil Summerfest at Lincoln Center Out of Doors and Cinema Tropical’s Janeiro in New York series. The 78 Project Movie chronicles Alex Steyermark and Lavinia Jones Wright’s journey across the U.S. to record today’s musical artists performing the early American songs that inspired a century of popular music—exactly as they were originally recorded, instantaneously, on one-of-a-kind 78 rpm lacquer discs. Recording sessions take place in backyards, living rooms, or wherever the equipment can be set up. The “one-take” aspect of recording directly to vinyl focuses and energizes the performers; one can feel something intimate happening as they sing. Inspired by Alan Lomax and his quest to record music where it lived throughout the early 20th century, the film celebrates the artistry and craft that spontaneously captured America’s most authentic musical forms. Presented in association with Americanafest NYC at Lincoln Center Out of Doors. After 20 years of democracy, South African artists, musicians, and designers add to the political discourse in a rapidly changing country. But how quickly is the society willing to change and how much resistance will it offer? The creative community takes on charged topics, such as political corruption, race, poverty, discrimination against the LGBT community, and whether defacing art in a public gallery is political expression, to varying degrees of backlash. Brett Murray, BLK JKS, Zanele Muholi, Gazelle, The Brother Moves On, Yolanda Fyrus, Fokofpolisiekar, The Smarteez, and many others are featured in this vibrant documentary where art, politics, and cultures collide. It’s been 30 years since the initial release of Jonathan Demme’s groundbreaking Talking Heads concert film, in which a black stage, basic white lighting, and long takes allowed viewers to engage with the band without distraction, giving a generous sense of being at the performance itself. Considered by many to be one of the greatest rock movies ever made, it’s both visually (who can forget David Byrne’s big suit?) and aurally stunning. Featuring “Psycho Killer,” “Burning Down the Hose,” “Slippery People,” “Take Me to the River,” and much more. Meet the inhabitants of the “Casa di Riposa” in Milan, the world’s first nursing home for retired opera singers, founded by composer Giuseppe Verdi in 1896. In his documentary Tosca’s Kiss, which has gained a cult following over the years and is a favorite among opera and music lovers worldwide, director Daniel Schmid has captured a world in which these wonderful singers (many of whom had significant careers on the opera stage) relive and reenact their triumphant roles of the glorious past. Tosca’s Kiss is a touching and often hilarious film on the subject of aging and the power and timeless capacity of music to inspire. With Sara Scuderi, Giovanni Puligheddu, Leonida Bellon, Salvatore Locapo, and Giuseppe Manacchini. Restored by Cinémathèque Suisse on the occasion of the film’s 30th anniversary. The Winding Stream begins at the source of what we know as classic country music—the original Carter Family from the Appalachian foothills. Unlikely superstars, A.P., Sara, and Maybelle Carter had their first success on the radio in the late 1920s. Maybelle brought up the next generation (Anita, June, and Helen) and they toured as Mother Maybelle and the Carter Sisters in the 1960s and 70s, influencing much of the folk revival. When June Carter married Johnny Cash, their combined family kept the musical legacy flourishing. George Jones, Rosanne Cash, Sheryl Crow, Kris Kristofferson, and many others cite the influence of what began as a small mountain stream and ended up a worldwide ocean. Presented in association with Americanafest NYC at Lincoln Center Out of Doors. Centering around the music of the band Glass Ghost, the visual component of this show is based on audience data, which is mined by LYFE™, a fictional company that identifies, analyzes, and advertises users emotions. Pre-show, participants take the MyLyfe™ survey, which asks them for a selfie, their online behavior, and drawings of a better future. During the show, as the music of Glass Ghost plays, audience members witness themselves and their data on the a screen—watched, quantified, and advertised, and then digitally disrupted as the LYFE™ software acquires an error and all data is erased and forgotten. The audience is then given a chance see their authentic selves laid out in front of them. LYFE™ is a music-video concert and audience participatory work in progress set for its world premiere in April 2015. Rare archive footage of musical performances presented by collector Joe Lauro, featuring such icons as Bill Monroe, Leadbelly, Elvis Presley, the Carter Family, Woody Guthrie, Sister Rosetta Tharpe, and The Staples Singers, among others. Presented in association with AmericanaFEST NYC at Lincoln Center Out of Doors.